Our modular system for helical servo gearmotors permits an endless range of variants. Configure each of your chosen drive solutions individually and based on the specific task. Save time and take advantage of the possibilities offered by the modular system for helical servo gearmotors of the R.. CMP.. series. As a result, you always get a drive which is optimally suited to your individual requirements. We also offer you a practical configuration tool. You will discover that our helical servo gearmotors are also an impressive option for your applications. This is particularly true for compact solutions with high demands in terms of precision. Particularly complex processes can be optimally implemented with the R..CMP.. helical servo gearmotors. This gives each of your systems a high degree of performance and efficiency. 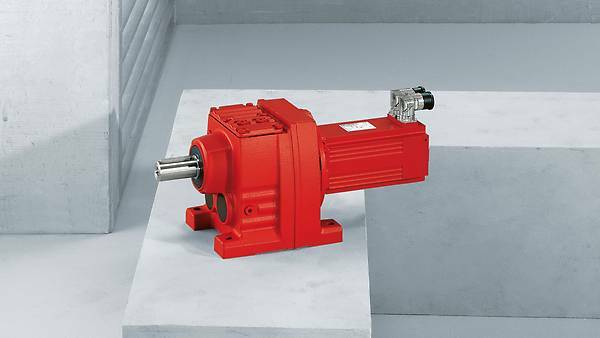 Rely on our wide range of accessories for helical servo gearmotors. It enables us to offer you more flexibility and scope in terms of planning and implementation. Our R..CMP.. helical servo gearmotors are always the perfect choice - particularly for lightweight system constructions. You save valuable installation space and can use installation options to the full. Powerful torques of 50 Nm up to 6000 Nm mean you have real power and precise dynamics. as the R..CMP.. helical servo gearmotors provide high torques and are highly energy-efficient in operation due to their design. as our CMP.. modular motor system for the helical servo gearmotors permits endless implementation possibilities. thanks to the lightweight design and compact dimensions for many installation options.